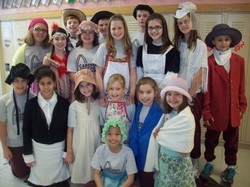 Costumes and props are wonderful ways to engage students in history! ​for check-out by Putnam City teachers. These costumes are adult sizes- they have been used with 5th and 8th grade students. The pictures below are samples. Several additional jackets and shirts are available in these colors. It is girls size 10-12- with drawstrings for flexible sizing.